In the mid-1990s, a parcel of land just south of Interstate 90 at the foot of Rattlesnake Mountain was proposed to be developed as an office park. On Saturday, the $2 million Snoqualmie Point Park that was built there instead will be dedicated. The 8.5-acre park is along the 100-mile Mountains to Sound Greenway. The U.S. Forest Service purchased 130 acres and development rights to the land at Snoqualmie Point in 2000. The city of Snoqualmie will own and manage the park. The park's entry road has a pervious surface to filter rainwater, and parking is limited to 21 cars, with a drop off point for buses. There is additional parking at the Rattlesnake Mountain trailhead to handle overflow. 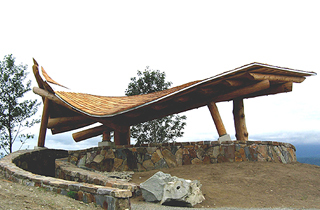 The park has a rock-walled view shelter supported by tree-trunk columns and covered with a sweeping roof. The restroom structure is designed to look like sheds commonly used in the early 20th century for logging operations. The upper part of the park has a contoured meadow for picnics and gatherings, and a small promontory will be used for weddings and other ceremonies. A natural amphitheater will be made for small concerts and events in the lower part of the park. In June the Greenway Trust and volunteers completed an 11-mile trail that starts next to the park and ends at Rattlesnake Lake, south of North Bend. The architect was Jones & Jones Architects and Landscape Architects, and the contractors were C.A. Carey Corp. for site work and the viewing pavilion, and Hodge Construction for the restroom. Other consultants include Sparling for electrical, M.K.A. for structural engineering, PACE Engineers for civil and Jones & Stokes Associates for environmental consulting. Funding came from federal, state, local and private sources including the Bill and Melinda Gates Foundation, the Federal Highways Administration, the National Scenic Byways Program and the Washington State Legislature.